American Horror Story showrunner Ryan Murphy has teased new details of the show’s eighth season, and we’re beyond excited. Murphy recently sat with Entertainment Weekly, teasing that the show will not only see the return of familiar faces, but it will be “unlike” anything fans have ever seen from the show. While details of the new season are limited, we do know that it’s expected to start filming sometime this year. 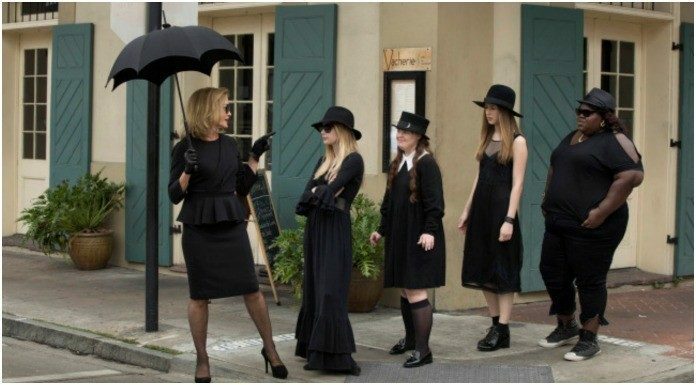 We also know that Evan Peters, Sarah Paulson, Kathy Bates, Billie Lourd, Joan Collins, Billy Eichner, Cheyenne Jackson, Adina Porter and Leslie Grossman are set to make their return to the show. While we’re not entirely sure what the forthcoming season’s theme will be, Bloody-Disgusting points out that there are rumors the show will be titled American Horror Story: Radioactive and that it will be set after a nuclear blast. What’s more? Murphy has also teased that the show will take place in the near future, sharing that it will be set “18 months” from April 7, which has us thinking maybe Murphy secretly shared that the premiere date is Oct. of 2019. Are you excited for the new season of American Horror Story? Let us know in the comments below!